On August 9, 2014 an altercation took place in which Ferguson Police officer Darren Wilson shot and killed Michael Brown, age 18, in self-defense. The Liberal media, before the facts of the incident were known, rushed to characterize the shooting of Michael Brown as being racially motivated. "...an unarmed 18-year-old black teenager, is shot dead by a white police officer on a street in Ferguson, Missouri. Some witnesses claim Brown had his hands up in surrender when he was shot." On November 25, 2014 a Grand Jury voted not to indict Officer Wilson on criminal charges. Protesters in Ferguson reacted to this decision with days of violence, looting, and gun fire. Property damage from the unrest ran unto the tens of millions of dollars. Many Black-owned businesses in Ferguson were looted and burned. The false notion that a white police officer simply murdered an "unarmed Black man" sparked days of rioting, violence, and looting not only in Ferguson but in other major cities across the nation. "We don't want you here Jesse!" Al Sharpton was heckled and ridiculed. The reporter used the opportunity to remind Rev. Al Sharpton of his time as a drug dealer and FBI informant against New York's Gambino Crime Family. Jackson and Sharpton were asked to leave the city. Local residents resented their presence. Others feared that their presence was counter-productive and would only serve to inflame the already volatile situation. The recent police shootings of Philando Castile and Alton Sterling, respectively, were used by activists and the media to fuel the false narrative that police officers were “targeting” Black men. Both Castile and Sterling, respectively, were armed with handguns and disobeyed lawful orders by police. Federal investigators for the Obama Department of Justice found that the officers in both shooting cases acted within the scope of their lawful authority and fired in self-defense. The officers in both cases were cleared by Grand Juries of any wrong doing. 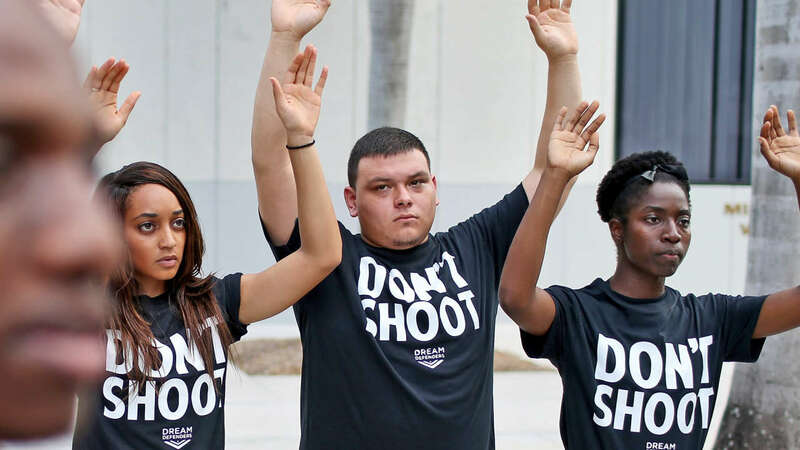 Undeterred by facts or evidence, activists, politicians, and the media amplified the bogus #HandsUpDontShoot narrative born out of the Michael Brown case. Their efforts to advance this false narrative would have tragic and deadly consequences. Micah Johnson was motivated to attack based on a fallacy. #HandsUpDontShoot was a lie. 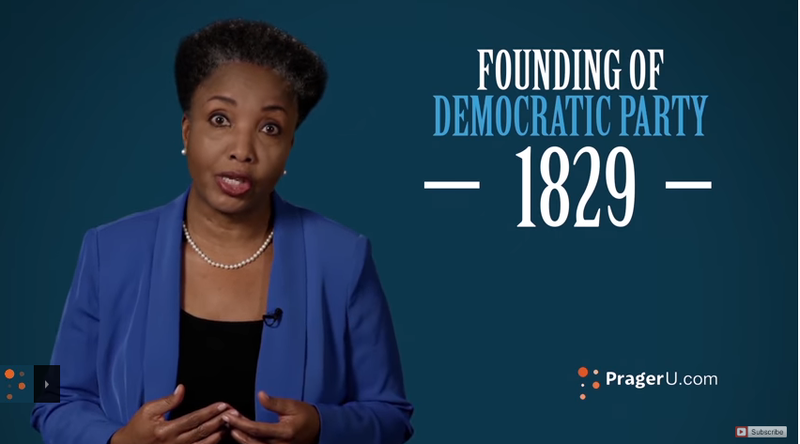 It appears that groups like NAACP have lost their way. They may have even lost their MINDS! In the wake of the police involved shooting of Michael Brown, the hash tag #HandsUpDontShoot went viral on every social media platform. Michael Brown died and a new meme was born. 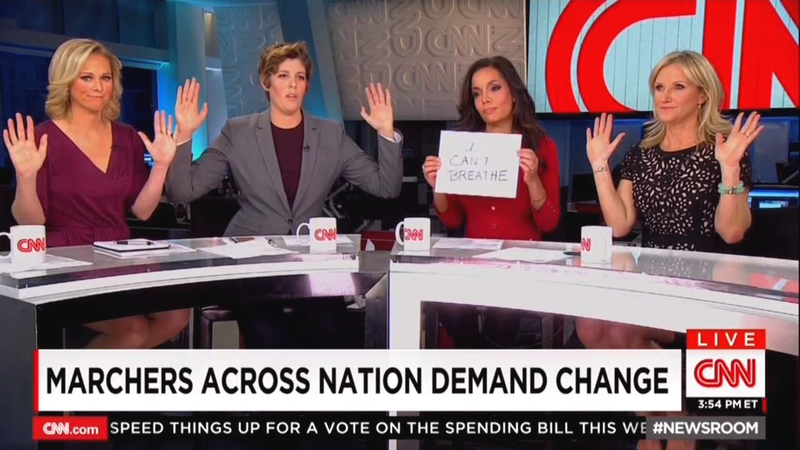 The #HandsUpDontShoot meme quickly appeared on everything from mousepads to billboards. For prices ranging from $9.95 to $19.95, enterprising "activists' sold T-shirts bearing the meme #HandsUpDontShoot. Actors and celebrities popularized the narrative by raising their hands in the air in mock surrender. Professional athletes took to the field with their hands raised in the air. 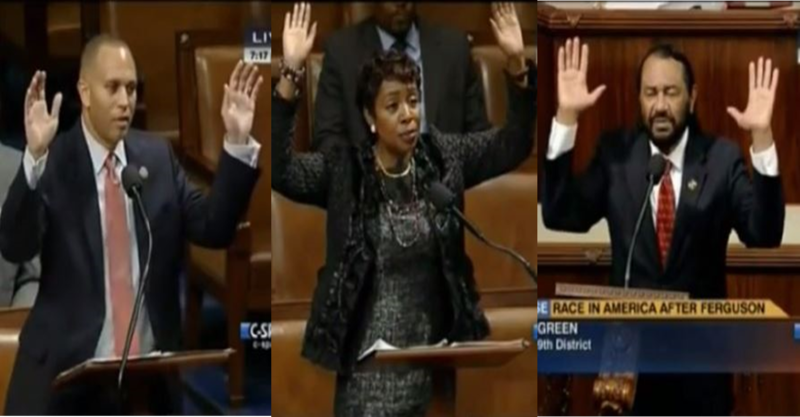 Members of the Congressional Black Caucus took to the floor of the U.S. House of Representatives to be photographed with their hands raised in the air. Colin Kaepernick, and other activists, seized on the tragedy to start a micro-movement called #TakeTheKnee. The resulting backlash against the NFL, its sponsors, sports media outlets like ESPN, produced declining stadium attendance and the lowest television ratings in the history of the league. In an unprecedented display of Federal overreach, President Obama's Attorney-General Eric Holder, with great media fanfare, arrived in Ferguson himself. His presence alone was intended to signal that grievous wrongs had been committed in the death of Michael Brown. The multi-agency investigation incorporated eyewitness statements, toxicology reports on both Wilson and Brown, and DNA analysis. 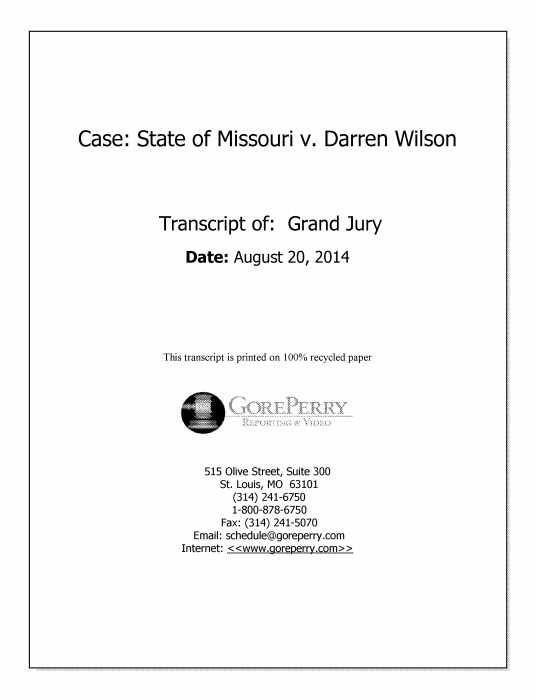 At the end of an exhaustive criminal investigation including local, state, and federal authorities, an 86-page report entitled "DEPARTMENT OF JUSTICE REPORT REGARDING THE CRIMINAL INVESTIGATION INTO THE SHOOTING DEATH OF MICHAEL BROWN BY FERGUSON, MISSOURI POLICE OFFICER DARREN WILSON" was released. The report from President Obama's Justice Department clearly states 1) Officer Darren Wilson acted in self-defense, and 2) Officer Wilson's actions were justifiable under the law, 3) Officer Wilson's actions did not violate Michael Brown's civil rights, and 4) Michael Brown's OWN actions were the reason for his death. The truth is that the entire incident between Officer Darren Wilson and Michael Brown played out over the span of just 120 SECONDS! Did a white police officer target, shoot, and kill an unarmed young Black man in cold blood? NO! Michael Brown and an associate were suspects in the strong-armed robbery of a convenience store that had occurred moments before Officer Wilson arrived. When Officer Wilson arrived in the vicinity, he was not aware that the two young men he observed walking down the middle of the street were in fact the robbery suspects. Out of concern for their safety, Officer Wilson pulled up and asked them to get out of the roadway. It was at this moment that Michael Brown, to the surprise and shock of the officer, uttered profanities and attempted to open the door of the police cruiser. He then commenced to attack the officer with his fists through the window of the police SUV. Witnesses, nearly all of them Black, describe Michael Brown going through the driver's side window of the police SUV up to his waist. Was Michael Brown unarmed? NO! Officer Wilson ordered Michael Brown to cease his attack. Fearing that he would be knocked unconscious, Officer Wilson, still seated in the police cruiser, and being beaten about the head and face, warned Michael Brown that he would shoot him if he didn't stop. The officer drew his duty weapon, which was the only weapon he could reach. Michael Brown grabbed the officer's duty weapon. A life and death struggle for control of the officer's duty weapon ensued. During the struggle for control of the officer's duty weapon, the gun discharged inside the passenger compartment. The bullet narrowly missed Officer Wilson's hip. The bullet did, however, strike Michael Brown in the hand causing him to cease his attack and flee. Officer Wilson exited his vehicle and gave chase. 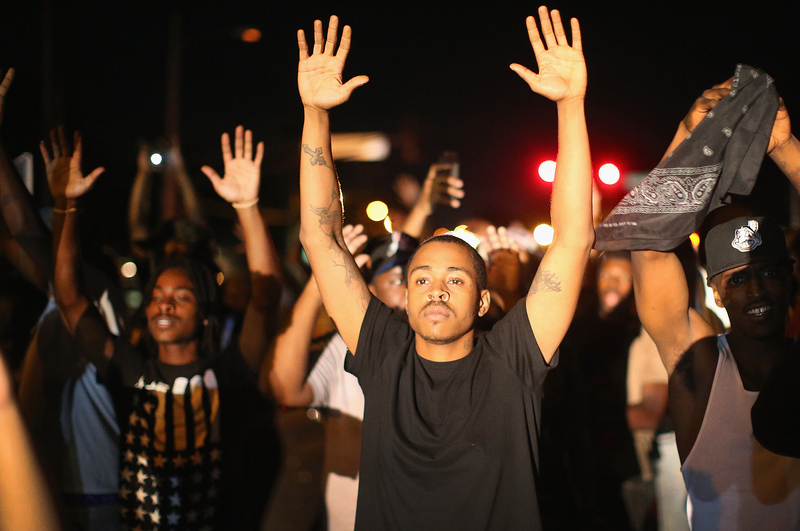 Did Michael Brown have his hands up in surrender when the officer opened fire? NO! According to the final Obama Department of Justice report, Michael Brown ran a distance of approximately 180 feet, turned, and then charged Officer Wilson. Michael Brown refused all orders to cease and desist. He closed the distance on Officer Wilson in a matter of seconds. Officer Wilson, fearing for his life, fired a total of twelve rounds in three round bursts at Michael Brown. Between each three-round burst Officer Wilson, loudly and clearly, ordered Michael Brown to stop. Michael Brown ignored the Officer's orders, AND the gunfire, and continued to close in rapidly. According to credible witnesses, Michael Brown DID NOT have his hands up in surrender. Was Michael Brown shot in the back as he ran away from the officer? NO! Three separate and independent autopsies were performed on the body of Michael Brown. One by the State of Missouri, one by the Federal government, and one by a private Medical Examiner hired by his family. Did Michael Brown have to die? NO! 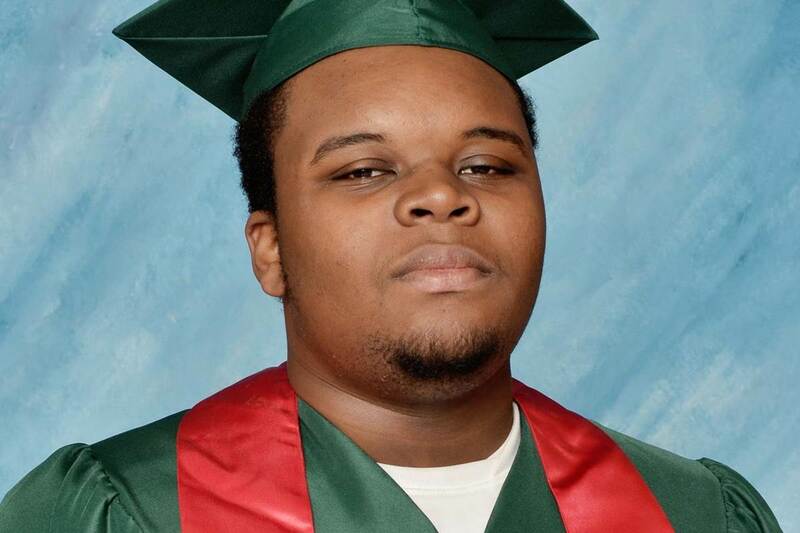 Toxicology results indicate that Michael Brown was under the influence of narcotics at the time of his death. 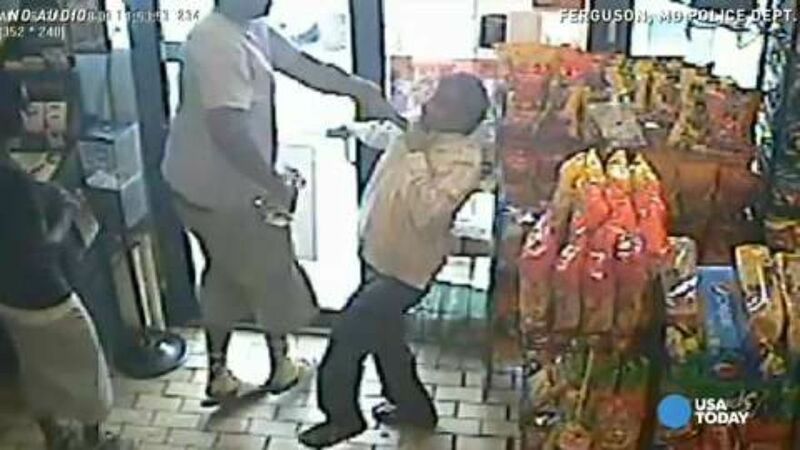 In conclusion, save for his own actions, Michael Brown would be alive today.